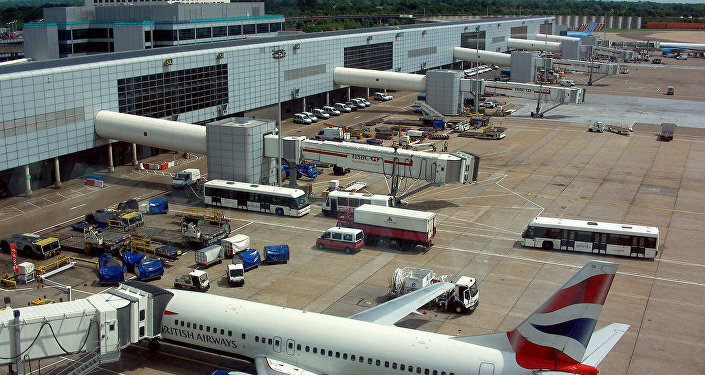 MOSCOW/LONDON (Sputnik) - London Gatwick Airport said on Friday it had again resumed its flights in the wake of their suspension following new reports of drone sighting in the area. "Flights have now resumed. Airfield movements were suspended while we investigated this as safety remains our main priority. The military measures we have in place at the airport have provided us with reassurance necessary to re-open our airfield," the airport wrote on Twitter. The Sussex Police said Saturday they have made two arrests in their probe into the "criminal use of drones" that has resulted in the suspension of flights at Gatwick Airport. "As part of our ongoing investigations into the criminal use of drones which has severely disrupted flights in and out of Gatwick Airport, Sussex Police made two arrests just after 10pm [22:00 GMT] on 21 December," Superintendent James Collis said in a statement. While the drone operators are still unknown, the police called on the public to report any information that can help bring those responsible for the incident to justice. Flights at London Gatwick were suspended between late Wednesday and early Friday amid reports that two drones were flying over the airfield. More than hundreds of thousands of people were affected by the cancellation of flights. The Sussex Police said earlier that it considered the flying of drones as a "deliberate" yet not terror-related act.